the crowd: 2011 - The year of contagion? 2011 - The year of contagion? In 2011, four of the major news events of the year concerned mass social influence or the spread of behaviours. The so-called Arab Spring is said to have begun with a self-immolation in Tunisia. The protests there escalated until President Ben Ali was forced to step down in mid-January. Egypt’s uprising also began with a self-immolation and eventually forced President Mubarek out of office as more people joined in. Uprisings of varying forms also took place in Yemen, Bahrain and eventually Libya, with unrest reported across the Arab region as a whole. In July, the plunging financial markets across the world were said to be subject to ‘contagion’, suggesting that ‘fear’ and ‘panic’ were rapidly spreading among investors. In August, the term ‘contagion’ was mobilized again – although more often the term used was ‘copy-cat’ – to ‘explain’ the spread of riots from Tottenham to Hackney, Ealing, Clapham, Birmingham, Liverpool, Salford and other places. Then there was the ‘Occupy’ movement. This began in Wall Street, New York, but soon spread to other cites in the USA as well as to the UK, in particular to St Paul’s, London. The terminology used in each of these news stories tell us a lot about how the events were evaluated. Specifically, the term ‘contagion’ is not simply descriptive, but serves to construct events as negative and pathological. In the UK media, the ‘Arab Spring’ ‘uprisings’ were largely described as a good thing, while the UK ‘riots’ were condemned. In fact, there was a very well-worn repertoire which was used to characterize the events in London, Birmingham, Manchester and so on: converge, submerge, and copy-cat. The riots were said to be about the ‘convergence’ of people who were ‘simply criminals’, their ‘submergence’ in the crowd (which supposedly leads to being ‘swept up’, ‘carried away’ and hence loss of self-restraint), and then the supposedly mindless ‘copy-cat’ riots, as ‘other people’ did the same thing elsewhere. The effects of investor behaviour on financial markets was also seen as bad; however, while the Occupy movement undoubtedly seen by some commentators as bad, this was not usually on a par with an illness. Perhaps this was because of their ‘moral’ message; bad behaviour in the markets was already the target. But maybe it was also because these events, unlike the riots, were not ‘violent’. Of all the ways to describe social influence and the rapid spread of ideas, beliefs, feelings and behaviours, why choose a disease metaphor? Why choose a term that likens the process to a sickness or illness? The concept buys you the implication that the spread is bad, or toxic, debilitating or harmful in some way. But it also implies that the spread is uncritical, simple, non-cognitive, primitive – that anyone is susceptible to just anything. Contagion is implied to be a non-rational process, maybe a deeply irrational one. Whether the spread of a behaviour, idea or sentiment is good or bad may be a value judgement. But whether or not just any behaviour spreads to just anyone is an empirical question. As Milgram and Toch (1969)2 pointed out in their critique of Le Bon, if behaviours and sentiments spread through contagion all those simply ‘submerged’ in a crowd, why aren’t riot police affected by the words of crowd demagogues? Why do the protestors in the crowd behave one way and the riot police another way? What are the limits of spread? The riot in the St Pauls district of Bristol, in 1980, afforded a systematic test of the idea that just any behaviours do not spread indiscriminately among just anyone. The riot was the first of the big 1980s urban riots. The event which was suggested to have set it off was a police raid on a local café. It was certainly a violent event – there were attacks on the police and on property; over 20 police vehicles were damaged. However, analysis of the event showed that there were clear limits to the spread of behaviours that simply do not make sense in terms of ‘contagion’. In particular, there were limits in terms of action. Essentially, the only people that were attacked were the police. The property that was damaged comprised banks, the benefits office, the rent office and the post office, and expensive shops owned by ‘outsiders’. But homes and small locally owned shops were actively protected. And there was disapproval when someone threw a missile at a bus. In other words, behaviours that were not consistent with the shared social identity of those in the crowd – St Pauls residents – did not spread. Recent research has added to this by showing how the spread of the 1981 riots – Toxteth, Brixton, Handsworth and others – was not random. Participants in the different cities did not mindlessly ‘copy-cat’ just any other person doing any action simply because they heard of it and had seen it on their televisions. Through a combination of mathematical modeling and oral history, the research was able to show that the riots spread partly through shared subcultural networks and partly when people recognize themselves and their own experiences in the others they saw rioting.3 This point will be developed below. For those in the mass media casting about for words to describe the rapid spread of a protest or direct action movement, whether in Algeria or Florida, ‘contagion’ is as an easy, off-the-shelf cliché. Looking at the origins of the term historically, the problems are clear. For the early ‘crowd scientists’, the crowd was an alien other – a source of irrational behaviour and hence of society’s ills. They sought to combat the crowd, and pathologizing it was a means of achieving that – for the attribution of irrationality served to rationalize increased coercion. In some areas of contemporary academia, though, there has been an attempt to rehabilitate the concept. An example is network analysis, which have attempted to redefine contagion as a form of rational social decision-making. But why try to reclaim this notion with all its baggage? Wouldn’t a more neutral concept like social influence or spread be less problematic? It might be possible to redefine ‘contagion’ as rational by stipulation; but the trouble is that it already has 100 years of history in which it refers to an irrational and pathological process. In psychology, ‘contagion’ persists in the concept of ‘emotional contagion’. This is said to be an often non-conscious transmission of mood between people. The implication is, again, that this is primitive and hence non-cognitive; and the origins and indeed pathologizing implications of the concept appear to be ignored by many who use the term. From a social identity perspective, the problem with the concept of ‘emotional contagion’, and indeed the types of paradigms that have been used to show evidence for it, is that there is a neglect of the meaning-defining role of group memberships. Implicit in studies where people ‘catch’ moods and emotions off others is shared group membership. Of course others’ laughter and tears is ‘infectious’ – in a shared ‘human’ context. But imagine a context where the people expressing emotion are so deeply ‘other’, where their world is so different from or irrelevant to yours, that the source of their emotions and feelings are alien too. Will you catch them then? We will be running some experiments to show that so-called ‘emotional contagion’ effects will be diminished in ‘alien’ contexts, but increased in those contexts where shared group membership is salient. In these cases, identifying with the crowd (as ‘us’) in each event also means recognizing the same enemy. For those involved in the riots, the police in Tottenham were not distinguished from the police in Hackney, for example: they were just the police, and equally illegitimate and vulnerable in each case. Therefore, where ‘we’ act and ‘they’ are seen to retreat in an event elsewhere, ‘we’ can infer that that ‘the same’ action may be possible here too. Only those who identify are empowered. There is no need to posit a different kind of theoretical account for what has happened in the ‘Arab Spring’ and the Occupy movement than in the case of the UK riots. The actions spread – they became a movement – because the relevant people took strength from the fact that they, as a physically dispersed but psychologically unified group, were seen to be able to objectify their understanding of how the world should be. We have been testing these ideas directly with some simple experiments. However, all the coverage and participant accounts produced following each of the movements fits this analysis. 1 McClelland, J. S. (1989). The crowd and the mob: From Plato to Canetti. London: Unwin Hyman. 2 Milgram, S. & Toch, H. (1969). Collective behavior: Crowds and social movements. In G. Lindzey & E. Aronson (eds. ), The Handbook of Social Psychology. Volume 4. (Second edition). Reading, Mass: Addison Wesley. 3 Ball, R. (2011). 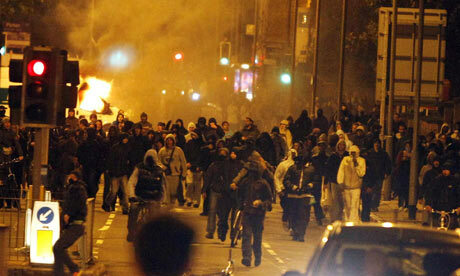 Violent urban disturbance in England in 1981. Unpublished PhD Thesis. University of West of England. 4 The case of the markets is different, for a number of reasons. First, there is a question over whether the market should be understood as constituting a psychological crowd at all. Second, unlike the three social movements, the markets are not an otherwise subordinate social group whose action changes their social relations. Therefore, third, if there is any shared social identification – if people in the financial markets do use others’ conduct as a guide for their own conduct – this social influence may well be as bounded (to ‘people like us’) as it is in any other ‘crowd’, but it can hardly be understood as a process of empowerment. Drury, J. (2002). ‘When the mobs are looking for witches to burn, nobody's safe’: Talking about the reactionary crowd. Discourse& Society, 13, 41-73. I am a Social Psychologist at the University of Sussex. My research is on the crowd. Crowd events are a locus of both psychological determination and transformation. My research examines how social identities both shape participants’ actions but also change their sense of self, with important psychological and political consequences. I am also studying mass emergency behaviour, in order to develop a model of collective resilience – for example by exploring experiences of crowd solidarity behaviour in the London bombings of 2005. With David Novelli and Steve Reicher, I have been examining the way that one's 'tolerance' for social density and 'personal space' varies in relation to whichever of one's social identities is salient in relation to the identities of others present. Crowds are routinely pathologized and/or criminalized. Such constructions have important implications for policy and practice. In my research, I have sought to problematize such accounts and hence suggest a language for the crowd that recognizes and indeed celebrates its positive potential in the social world.